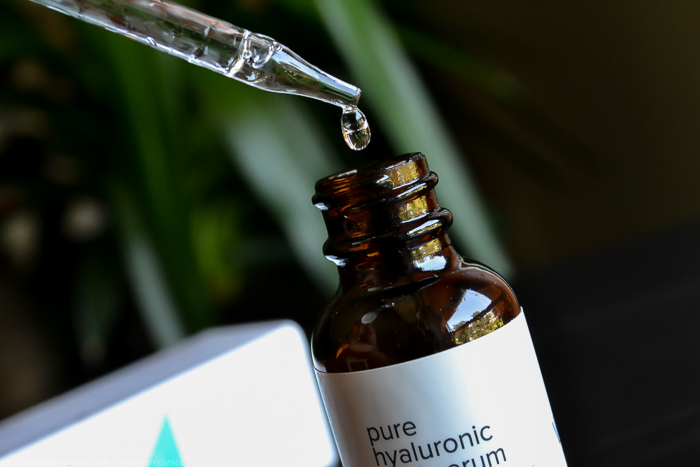 Hyaluronic acid seems to be the new must-have skincare ingredient, but it has been around for a while now, used mostly as an injectable filler to help plump up skin and reduce the appearance of wrinkles. Now, though, hyaluronic acid seems to be have found popularity as a topically applied anti-aging and moisturizing ingredient with every other brand now releasing a cream, serum, or mask (or all three) containing this miracle ingredient. My first experience with a hyaluronic acid containing product was the Chanel Resynchronizing La Nuit serum, and I was quite impressed with its moisturizing benefits. 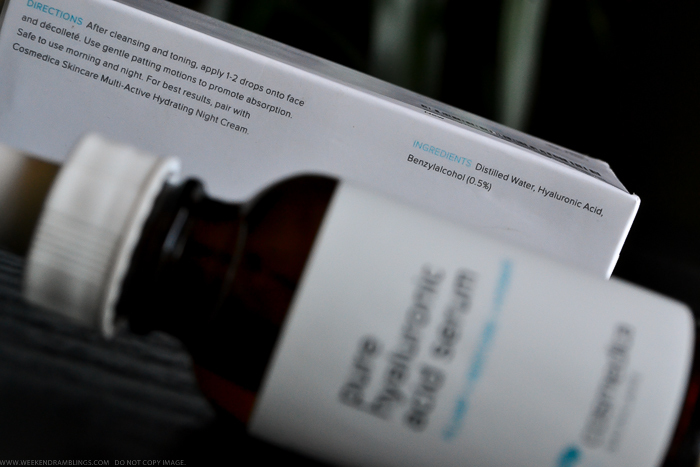 This was my go-to serum until recently, but I wanted to try out a less expensive option and bought the Cosmedica Hyaluronic Acid Serum from Amazon after reading the many positive reviews on it. Scroll on for my thoughts on this product. 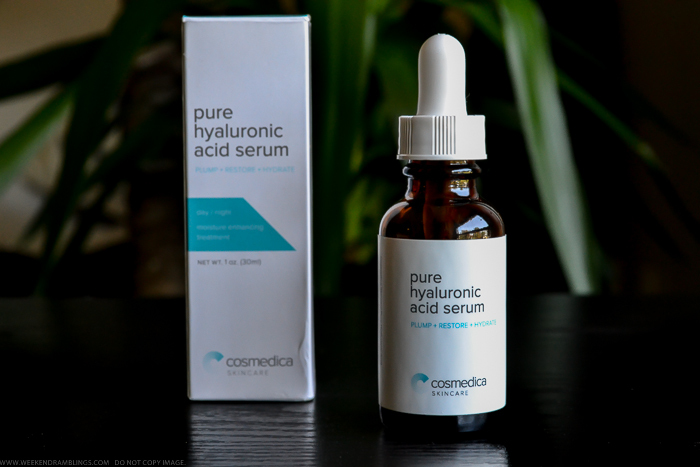 Cosmedica Hyaluronic Acid serum comes packaged in a dark glass bottle with a dropper for dispensing the product. The serum itself is clear and slightly thick in consistency but feels almost like water. It has no particular fragrance to it either. The ingredients are pretty basic - hyaluronic acid, distilled water, and benzyl alcohol. I use it as directed, using about 2-3 drops patted on to clean, damp skin followed by my usual moisturizer. As for results, in my opinion, hyaluronic acid is a very moisturizing ingredient. It can bind up to 1000 times its weight in water and so helps skin hold on to moisture better. I have oily-combination skin, and I tend to get a few patchy areas of dryness in certain parts of my face while the rest of my skin remains either normal or oily. Using a heavy duty moisturizer to sort out these dry patches doesn't help, and that's where using a hyaluronic acid serum has proved effective for me. Ever since I started using this serum, I haven't had any dry flaky skin, and my skin does feel overall better moisturized. If you have perfectly normal skin, I am not sure if you need or are going to see any obvious difference with using the Cosmedica Hyaluronic Acid serum (or any other hyaluronic acid serum), but it might help in the long run by enhancing the efficacy of your regular moisturizer. Cosmedica Hyaluronic Acid serum is listed as 100% Pure serum, etc., on Amazon, and I erroneously believed this to mean it contains 100% hyaluronic acid which is not correct. This is merely an industry standard term used to refer to a solution that contains 1% concentration of hyaluronic acid (I assume the same theory applies to serums which claim to be 75% hyaluronic acid). The Cosmedica website (check link above), however, clearly mentions the concentration of hyaluronic acid in this serum to be 1%. From what I have read online, this concentration is quite sufficient for a topically applied serum. Increasing the concentration apparently makes the resulting solution very viscous and difficult to use. The moisturizing properties of hyaluronic acid actually come from its property of holding on to water, so I would suggest applying this serum on to clean, damp face to enable the serum to bind and hold on to the moisture in the skin. If you live in a place with an extremely dry climate, you might actually notice your skin feeling tight as the serum gets absorbed because there is not much moisture in the air for it to draw, so hyaluronic acid pulls moisture away from the skin instead. Always follow application of the serum with a moisturizer to provide some actual moisture to the skin, with the serum acting more as a carrier. As mentioned earlier, I had bought the Cosmedica Hyaluronic Acid serum as a replacement for the Chanel Resynchronizing night serum. Apart from all the obvious differences between a luxury skincare line and a basic no-frills serum, Chanel's version feels much more moisturizing, and I believe this is because it contains extra moisturizing and smoothening ingredients in it apart from just hyaluronic acid. Cosmedica's hyaluronic acid serum doesn't feel as moisturizing, but I have to follow both with my regular moisturizer, so in the end, the difference isn't too much. Which brings me to the last point, in an ideal world with an unlimited beauty budget, I would recommend everyone to give Chanel Resynchronizing skincare line a try. 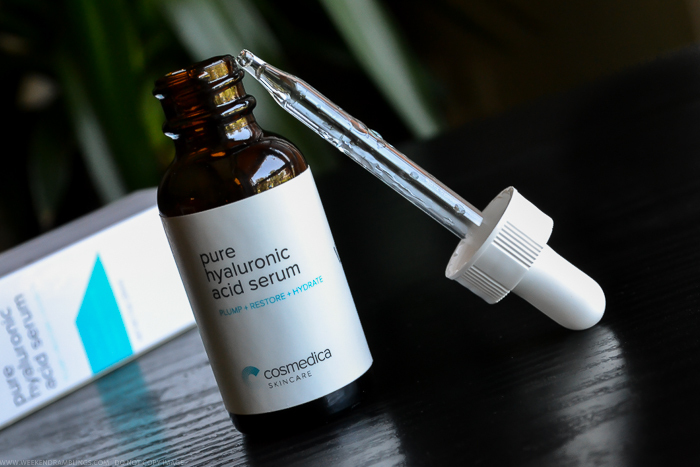 If you are on a budget and/or would just like to try a hyaluronic acid serum, though, then the Cosmedica Hyaluronic Acid serum would be a good buy. A 30 mL bottle (lasts a long time) retails for about $10 and is a relatively inexpensive way to try out this new favorite skincare ingredient. I am almost done with my bottle of Cosmedica serum, and I am still undecided about repurchasing. 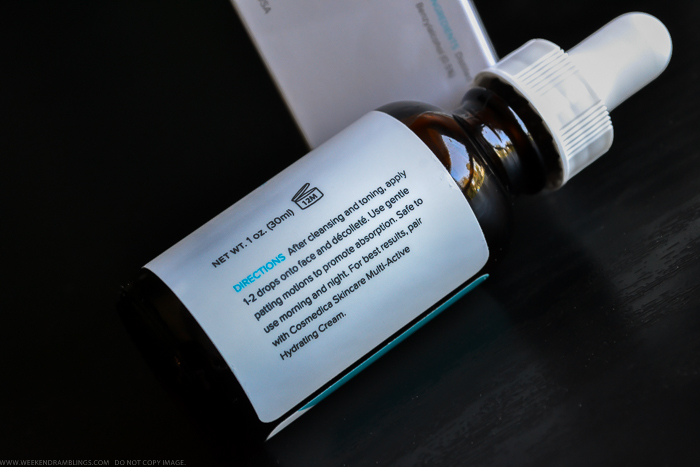 I had pretty realistic expectations from this serum, and I have been quite happy with this simple addition to my skincare routine, but I do want to try out other skin serums and maybe pick something that's geared towards tackling pigmentation and sun damage instead. And , that Drop !